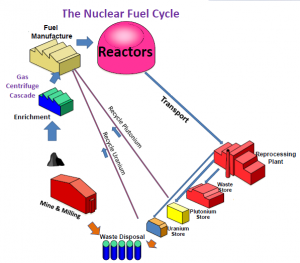 An important paper from our colleague Raymond Dreher has just by published in the Annals of Nuclear Energy. In this paper Raymond reports a new solution to the Bateman equations for the case of equal eigenvalvues (for example in cases where daughter product have the same half-lives). The solution has already been implemented in Nucleonica’s Decay Engine for the calculations of radioactive decay chains. Introduction to Nucleonica: Core Applications and Tools, 18-19 April, FTU-KIT, Karlsruhe, 2013. The next Nucleonica training course will take place in Karlsruhe on 18-19 April 2013. The focus of this 2-day introductory course will be nuclear data and related nuclear science applications. The course is aimed at persons who provide technical support (measurements, interpreting results, drawing conclusions, making recommendations) for the actions taken in response to environmental radioactivity issues, nuclear security, decommissioning, etc. The course is suitable, for example, for physicists, radio-chemists, health physicists, technical experts etc. working within the nuclear industry, nuclear research organizations, universities, regulatory authorities and nuclear medicine institutes. Completion of this course will enhance and support nuclear related decision-making as well as provide formal academic knowledge in the field of nuclear science. A basic knowledge of physics and chemistryis required for participation in this course. The sessions will be held in English. Participation in the training course is the most efficient way to become an expert user of Nucleonica’s many available applications, to obtain an overview of the nuclear science portal and to get to know the Nucleonica Team. Enhance your productivity by signing up for this course. Introduction to Nucleonica: Core Applications and Tools, 21-22 November, BfS Berlin, 2012. This 1-day training course took place at the offices of the Federal Office for Radiation Protection (Bundesamt für Strahlenschutz BfS) in Berlin, during the 21-22 November 2012. This was an introductory training course which focused mainly on the Nucleonica core applications and tools. A detailed description of nuclear data with particular reference to the various Nucleonica nuclear databases was given. Core applications were demonstrated through the use of Nucleonica tools such as the Decay Engine, Dosimetry and Shielding and the Gamma Spectrum Generator. 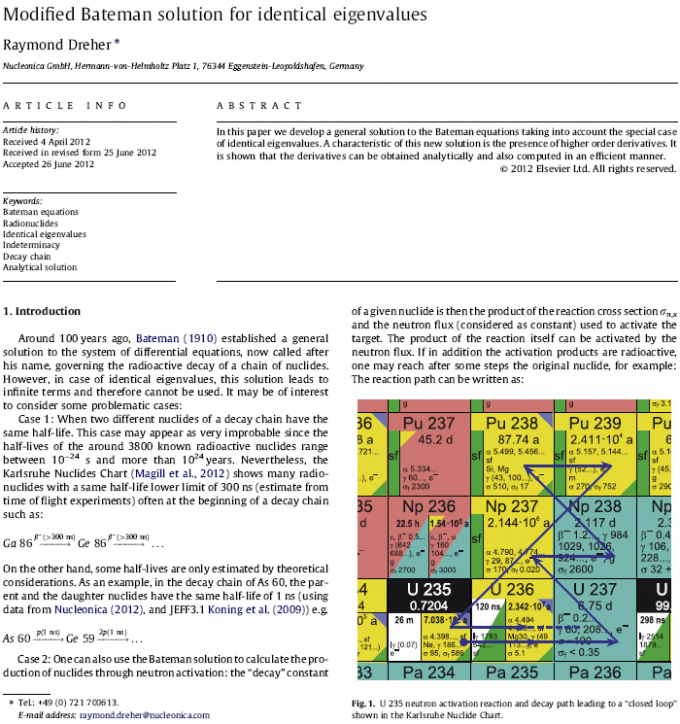 A case study on Working with Reference Materials showed how the various Nucleonica modules could be combined to fully characterize reference nuclear materials. In total, 12 persons took part in the course from the various BfS locatins in Germany. Speakers included Drs. Z. Soti from the JRC/ITU in addition to Dr. J. Magill and Mr. R. Dreher from the Nucleonica team. Nucleonica nuclide libraries in Genie2000 format. 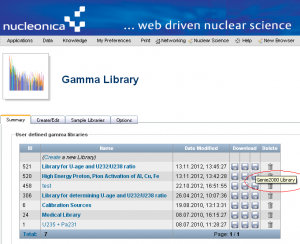 The Gamma Library application is a very user friendly tool for nuclide library creation using the up-to-date nuclear data available in Nucleonica. It is possible, for example, to create directly binary libraries for Ortec’s GammaVision software. In a new development, it is now possible to create intermediate text-based files for Genie2000 libraries. A separate application is available which can then transform these text-based intermediate files to binary Genie2000 libraries (for information on this application please contact us at info@nucleonica.com). The Technical University of Munich (TUM) now has a giant version of the Karlsruhe Nuclide Chart in one of the lecture theaters. This is the new 8th Edition of the Karlsruhe Nuclide Chart from 2012. The Wallchart dimensions are 3.50 x 2.52 m. Each nuclide box has a size of 35 x 35 mm (the original wallchart has a nuclide box size of 14×14 mm). In the photo below, the nuclide chart is shown above the door to the lecture theater on the right hand side. 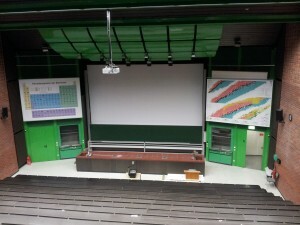 Courtesy Dr. Florian Kraus, Hans-Fischer-Hörsaal des Departments Chemie der Technischen Universität München. A meeting of the GRS (Gesellschaft für Anlagen- und Reaktorsicherheit) and Nucleonica teams took place on 8th November at the GRS headquarters in Munich. The aim of the meeting was to discuss potential areas of collaboration. Of particular interest was the subject of knowledge management underlying program code development. 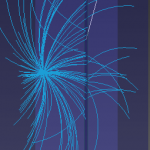 The GRS expertise in reactor physics and Nucleonica’s expertise in web-based scientific applications are complimentary for sustainable code development. A collaboration agreement for future joint developments is under preparation.